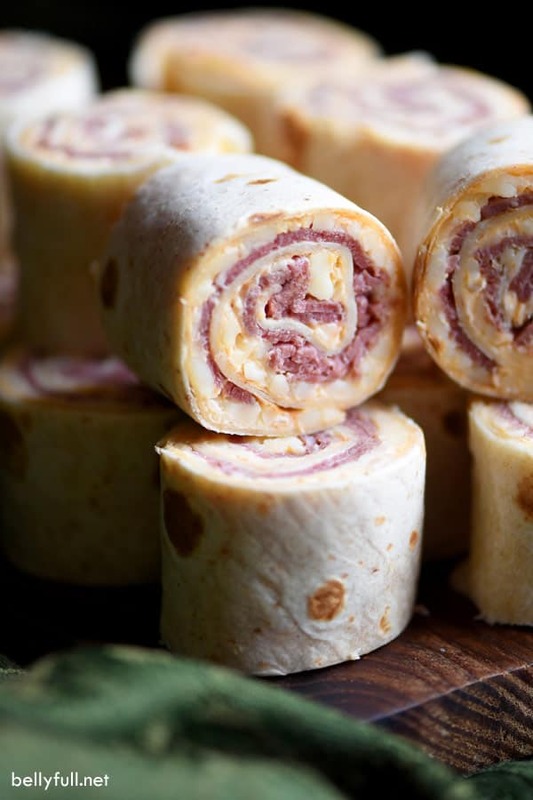 These Reuben Pinwheels are filled with corned beef, sauerkraut, cream cheese, thousand island dressing, and swiss cheese! 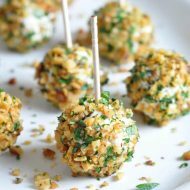 Such a quick and easy, crazy delicious appetizer for St. Patrick’s Day or any get together throughout the year! Have you seen this meme about paper plates? > “Paper plates ain’t got nothing to do with struggling. I just don’t like washing dishes. I wish I could use paper pots, too.” LOL. I love it, because I loathe washing dishes. Paul knows this, since he’s usually the one to do it. At least after dinner, anyway. During the day when I’m full-force into recipe development and filming, I’m on my own. Sigh. This is definitely one, of many, reasons why I love finger food so much. No plates and no silverware to wash! 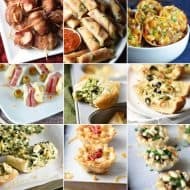 We hosted our usual Super Bowl gathering and not one single dish required cooking or a fork. It was glorious. 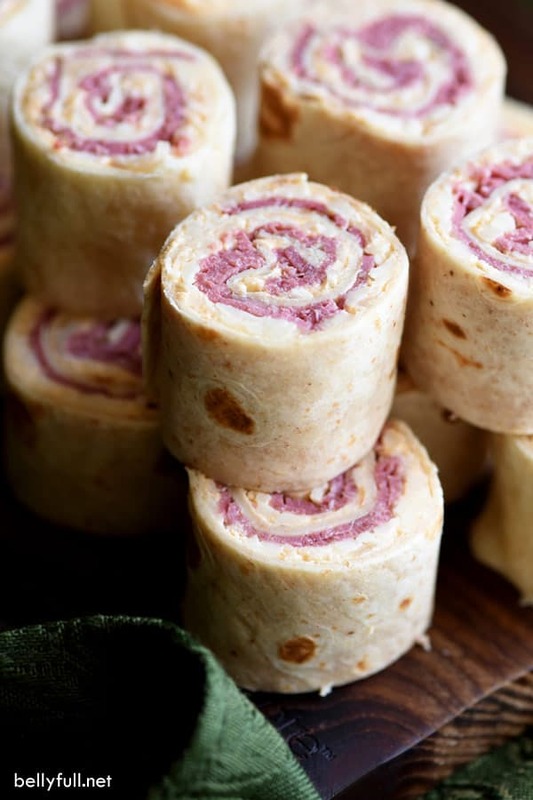 These Reuben Pinwheels were one of the appetizers I set out….and they were one of the first to disappear. I’ve made them three more times since then. THREE more times in less than two weeks. That’s how much everyone loves them. Even Paul who’s not a huge lover of corned beef, and even less of a sauerkraut fan, said they were delicious. And naturally my kids loved them, because…Thousand Island dressing. They’d slather that stuff on everything if I let them. 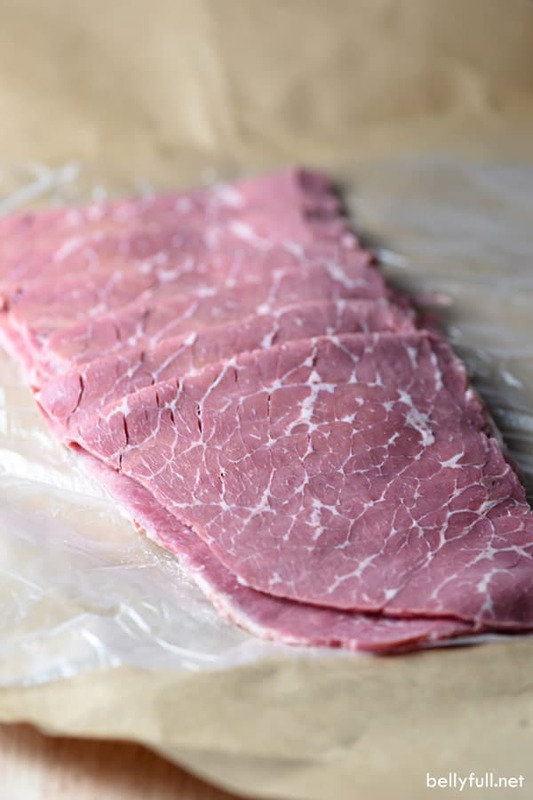 Just look at this corned beef, fresh from the deli…beautiful! For those of you who hate sauerkraut, I swear it’s not overpowering at all, but simply gives the pinwheels a little texture and tang. And naturally my kids loved them, because…Thousand Island dressing. They’d slather that stuff on everything if I let them. What’s the secret to making the best tortilla pinwheels? 1. 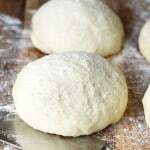 Make sure you use soft, fresh, good quality flour tortillas. This prevents any cracking when you roll them up. 2. 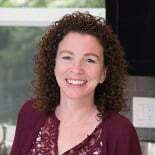 Buy the freshest, best quality corned beef from your grocery store’s deli counter, not the prepackaged stuff. 3. Your cream cheese should be room temperature, to make mixing and spreading effortless. 4. Evenly distribute your toppings, so you get all the flavors in every bite. 5. Roll these bad boys up tightly! This allows the flavors to blend and the pieces to stay together once you slice them up. 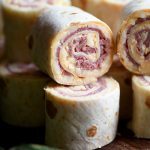 These Reuben Pinwheels deliver a circus of flavors in your mouth and guaranteed to be a hit at your next party. Pinwheels transport easily too, making them perfect if you are the one needing to bring something! 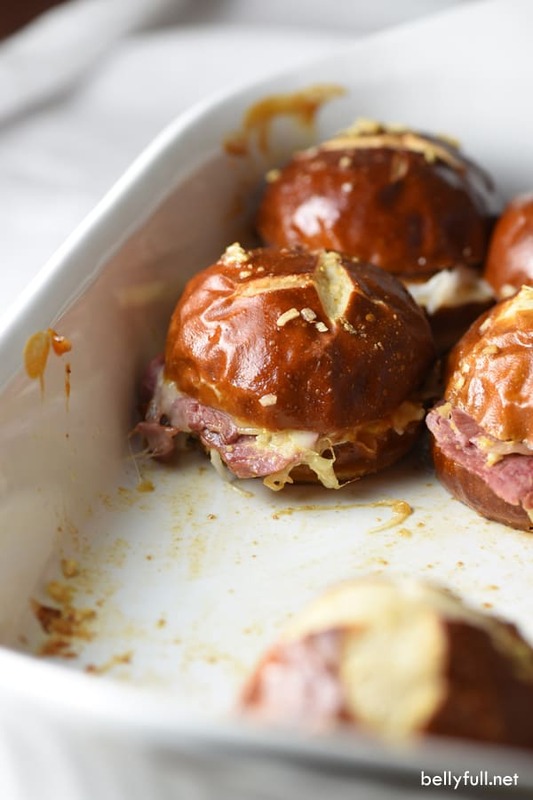 These were inspired by my Reuben Pretzel Sliders. 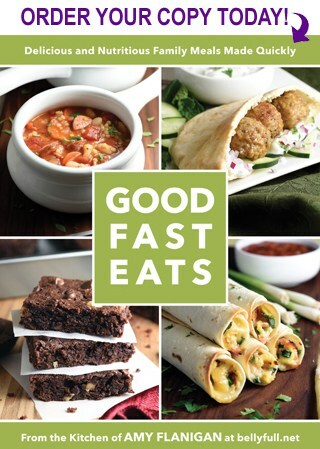 So good! Other Pinwheels you might like! 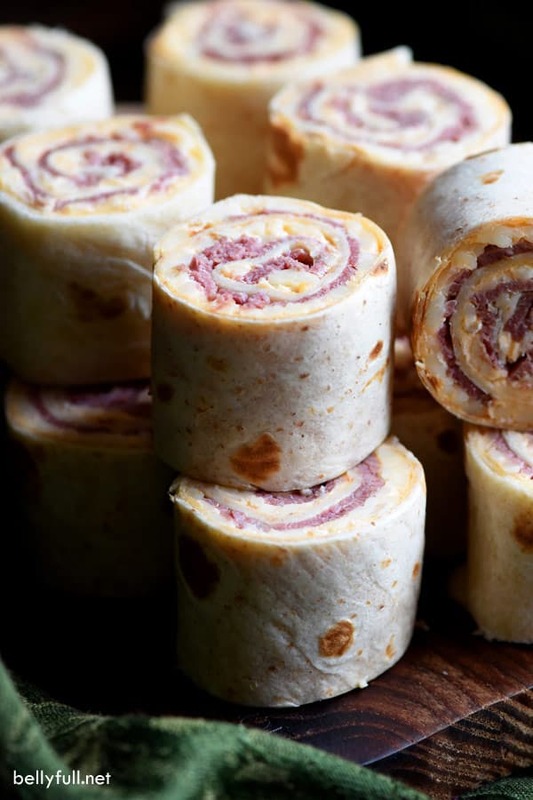 Watch the video of Reuben Pinwheels to see how they’re made! In a medium bowl, mix together the cream cheese, Thousand Island dressing, and sauerkraut until smooth and well blended. Scoop 2 heaping tablespoons of the cream cheese mixture onto one side of a tortilla; spread evenly almost to the edges. Sprinkle with 1/4 cup of the cheese. Lay 2 slices of the corned beef (tearing the slices to make fit, if necessary) on top of the cheese. Roll the tortilla up tightly. Repeat with all other ingredients. 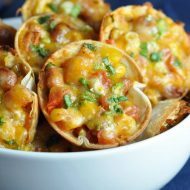 Wrap the tortilla rolls in plastic wrap and place in the refrigerator for at least 1 hour. Remove from refrigerator and discard plastic wrap. Cut into rounds about 1 1/2-inches wide. Serve and enjoy! 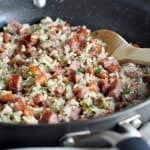 You want the cream cheese mixture to go almost to the edge of the tortilla, and for the corned beef to be inset a little from that, otherwise there won't be a proper seal when you roll them up. 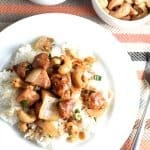 These are best when they have time to sit in the refrigerator for at least an hour. You can make them up to 12 hours in advance, but I personally wouldn't go beyond that because the cheese can start to discolor and the tortillas become a little too soft for my liking. My bad. I miss read ingredients. Both cream and swiss are used. 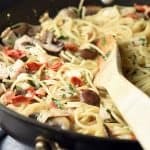 Why is cream cheese mentioned but shredded Swiss in the actual recipe? Hi Karen – confused by your question. They’re both listed in the ingredients, and both mentioned in the instructions. Might want to read it again? Wait. There was sauerkraut in them? Jeez I didn’t even know.